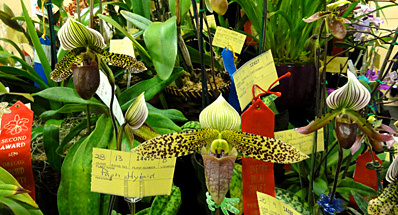 Orchid growers are reputed to pamper their plants excessively. However, over-watering and over-fertilizing are two symptoms of a "mothering" of plants that can be deadly. 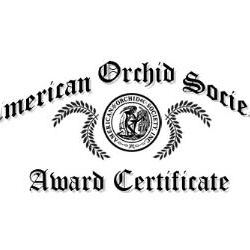 Most natural species orchids are adapted to harsh and low nutrient conditions, with roots in well drained media, if covered at all. Given this the use of potting media is used not for nutrition as with most plants but to help provide moisture in the artificial environments of the home, office, or greenhouse, as well as temporary support while roots are growing. 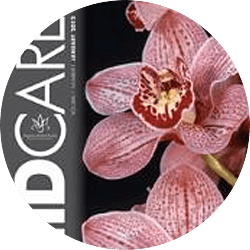 Media breakdown through time is related to watering and fertilizing, and is a significant problem for the majority of cultivated orchids. The more decayed the media then the less breathable it is for the orchid's roots. 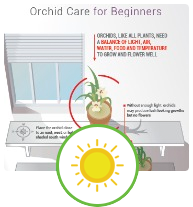 Interestingly, there is an insect that can be used as an indicator of poor orchid care, even though they are commonly considered pests. Probably all orchid growers have at least some of this insect in their plant collection, namely, fungus gnats. 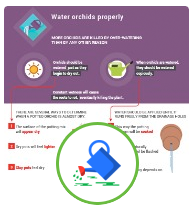 Fortunately, for orchid growers, these little flies are usually mere nuisances, only.. The common fungus gnats in the hobby orchid collection are small (ca. 1.5-3.0 mm), long-legged, long-antennaed, delicate flies with dark bodies and one pair of dusky-grey to black wings. Insect taxonomists place these small flies into the family Sciaridae (pronounced: "sy-are-ee-day"), with the common name "dark-winged fungus gnats." This taxonomy helps discriminates them from a wide diversity of related gnats that feed on fungi. [Gnats are simply small flies, most of which do not bite!] As with most other insects with four life stages (i.e., egg, larva, pupa, adult), it is the larva or maggot that does most of the feeding. Adult fungus gnats do not bite and are absolutely harmless to people and pets. Fungus gnats are widespread and very common insects. Adult dark-winged fungus gnats fly in search of fungi. The females lay their tiny white eggs in moist to wet soil. When the eggs hatch, the slender translucent-white maggot with a distinctive shiny black head feeds on fungal growths and measures about 4-5 mm in length when mature. After about 2 weeks, depending on temperature and moisture, the maggot transforms into the pupal stage, then emerges a few days later as an adult fly. The entire life cycle takes about a month. As the name indicates these flies are associated with fungi. But, why are they so common around potted plants? Well, it is not because they are feeding on your plants, usually! They are common because their larvae are feeding on the fungi growing in potting media that is too moist or wet, is warm, and in media that is decaying quickly. In other words, it is the over-watering and over-fertilizing of your plants that brings out the best in these cute little flies. Fungus gnats are more abundant in older and moister potting media that is rich with fungi. Organic potting materials will decay faster with higher levels of fertilizers because nitrogen also feeds the fungi and other decay organisms. Usually, the maggot feeds only on fungal growths. However, larvae will also feed on seedlings, dying and rotting tissues such as roots, and will rapidly devour a leaf resting on the surface of moist potting media. Feeding on roots of seedling orchids has been observed, possibly due to a combination of sterilized media, high moisture, stressed plants, and lack of fungi for the maggots. Adult fungus gnats are usually the first life stage to be seen of these insects. The adults are active on the surface of the potting media, often running along the edge of the pot. They fly readily and are often found at windows. Yellow sticky cards, the kind used for whiteflies and aphids, are excellent for monitoring adult fungus gnats. Check for larvae by watching for declining plants, then or otherwise unpotting the plant and examining the media for white to translucent, slender bodied, black headed maggots. These will usually be clustered around decaying roots and rhizomes, and fungusy clumps of media. 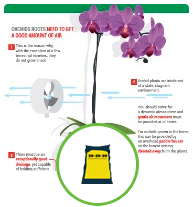 Fortunately, fungus gnats are usually easily managed and can be kept in check in most orchid collections. Yellow sticky cards sold for monitoring and control of aphids and whiteflies are excellent for trapping fungus gnats. These cards are so effective when there are only a few flies that there is no need to use any insecticide on these flies. However, often female gnats will fly little so sometimes it is useful to cut strips of the cards and insert these strips into a pot to capture more of the females. 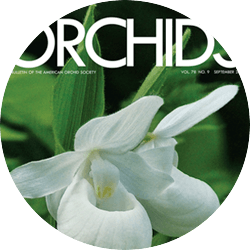 Larvae are easily controlled by adjusting watering and ensuring that your orchid media is not overly decomposed and is draining well. This may require frequent repotting if you use a heavy watering regime. 2. Do not keep the media constantly wet and if possible allow the media to dry between waterings, especially the upper inch or so of media. 3. Keep fertilizer to the minimum needed for the plant and adjusted to the potting media used. Should these cultural methods not be effective or the collection be large, then alternative treatments may be warranted. However, the use of insecticidal drenches for controlling the maggots is not recommended, except as an absolutely last resort. 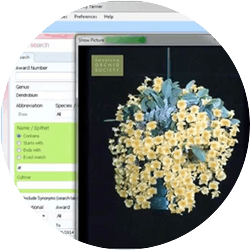 Severe infestations of large collections may be best treated with biological control methods. The use of bacteria, nematodes, and predatory mites is highly effective in greenhouses and may work in large collections. Bacterial treatment is most effective against the young larvae early in the cropping cycle and uses Bacillus thuringiensis israelensis is sold under the trade name of Gnatrol™ for greenhouse use. This type of B.t. affects only true flies (Order: Diptera) and is different from the B.t. used for caterpillars in the garden. The B.t. causes paralysis of the maggots gut, stopping feeding and killing the maggot. Gnatrol™ is applied as a soil drench to thoroughly wet the soil of pots, flats, beneath benches, or other sites of infestation. It is only effective for about 48 hours so 2-3 applications may be needed with heavy infestations. Use of Gnatrol™ is not recommended with simultaneous use of fertilizers or fungicides containing copper or chlorine. It will not affect the adult fungus gnats. Parasitic nematodes are also useful for controlling fungus gnats. They enter the insect's body and multiply inside the host insect. While feeding they release a bacterium that is toxic to the host. The nematodes complete their life cycle within a few days so large numbers of infective stage nematodes are produced that will continue to search for new hosts. These beneficial nematodes can be applied as a drench to the growing media and to soil under the benches. Two common species available for greenhouse use are Steinernema carpocapsae, sold as ScanMask™, and Steinernema feltiae, sold as Nemasys™. Finally, a small predatory mite, Hypoaspsis miles also attacks fungus gnat larvae. These mites are usually sprinkled over or mixed into the potting media before planting. This mite is long-lived, will usually persist as a scavenger on dead insects while continuing to seek fungus gnat maggots, and will also feed on thrips pupae and other pests. Chemical control of fungus gnats is diverse, but always a temporary remedy. Adults may be eliminated with any insecticide spray for flying insects, though this is decidedly a temporary fix and will not affect those adults emerging after the spray has settled. Good control of fungus gnats requires removal of the larvae, hence the high value of environmental management, i.e. adjusting water schedules and repotting. Chemical control of larvae is best done with drenches of carbaryl, permethrin, imadichloprid, diazinon, malathion, and other common pesticides, and even isopropyl alcohol. However, and again, these are only temporary solutions as the flies will reinvade the pots once the chemical residue is degraded and the potting media remains wet and decaying.